Retired Captain Jim DeWees was sworn in as the 58th Sheriff of Carroll County on December 2, 2014. We wish Jim continued success as he assumes leadership of the department. 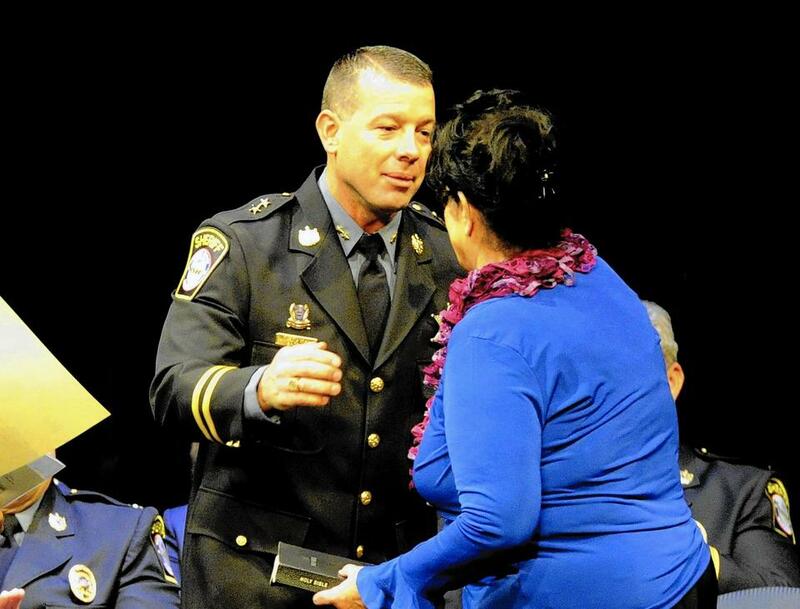 When Sheriff Jim DeWees met the woman he would later marry, he told her that when he retired from the Maryland State Police, he was going to run for sheriff. He also told her that on the day he retired, he wanted to own a Corvette. After DeWees, a Republican, won the race for Carroll County sheriff, defeating Democrat Vince Pacelli with nearly 78 percent of the vote Nov. 4, Heather DeWees surprised her husband with a 1998 Corvette that night. "He was like a kid on Christmas," she said. DeWees was sworn in Tuesday as the 58th sheriff of the county. He thanked his wife — particularly for the Corvette — as well as his children, Mackenzie, Brett and Gavin, for their support during the nearly two-year process of becoming sheriff. "I simply never thought I'd be at this point," he said, calling the campaign the most challenging endeavor of his life. Heather DeWees said she knew that running for sheriff was a goal of her husband's, so she wasn't surprised when he wanted to take on the challenge. She called campaigning stressful but exciting. "It's been a family adventure," she said. "We embraced it. We ate a lot of carnival food." Heather DeWees said it was difficult to adjust to being in the public eye because she was raised in a police family — her father is a retired West Virginia state trooper — and was trained to avoid giving out personal information. Despite her concerns, she said friends and family have been extremely supportive, from participating in fundraisers to picking up and dropping off the DeWees' three children from various sports and activities. Though she said she didn't realize how much the campaign would engulf their lives, Heather said things have been getting back to normal since the election. Jim DeWees said Tuesday he could not have achieved what he has without his wife and children. "My kids have been wonderful throughout the entire campaign," he said. The new sheriff also thanked his mother, siblings and in-laws in attendance Tuesday as well as the voters of Carroll County. Finally, he thanked the Carroll County Sheriff's Office and its staff members, who conduct road patrols and criminal investigations and manage the Carroll County Detention Center and courthouse security. "I am proud and honored to be your sheriff," he said. "I will work hard to earn your respect. I work for you." DeWees retired from the Maryland State Police as a captain serving as the Special Operations Division Commander. He spent 25 years with the state police, beginning his career when he was 18, and said the agency had a hand in raising him along with his family. Maj. Scott Wayne, commander of Special Operations and Transportation Safety Command, said he has known DeWees since they went through SWAT training together 20 years ago and was not surprised to see him becoming sheriff. "He has deep roots in Carroll County with his friends and family," he said. "Who doesn't want to see their home county flourish?" Wayne also said he has seen DeWees rise through the ranks of the state police and each promotion has not been a shock. "I'm so proud of him," he said. "His entire career he's always worked to better himself, better the agency." DeWees told members of law enforcement and the public Tuesday he plans to take responsibility for fighting the problem of heroin in the county. There were 25 opioid-related deaths in Carroll County this year through the end of October, according to statistics from the Carroll County Sheriff's Office. "This county has seen an emergence of heroin-related overdoses and deaths," DeWees said. DeWees said he has spoken with the municipal police chiefs as well as representatives for the Maryland State Police Westminster Barrack and Carroll County State's Attorney's Office about cooperative efforts to make it difficult for drug dealers to operate in the county. But DeWees said arrests and prosecutions alone will not stop the problem, and law enforcement need to partner with the Carroll County Health Department and other resources for prevention and treatment options. "Prevention is a huge aspect of this," said interim State's Attorney Brian DeLeonardo, who will officially take over the office in January. DeLeonardo said he wants to be more proactive in educating the public about the dangers of heroin and other controlled dangerous substances. as well as active in identifying repeat offenders whose conduct is tied to addiction. "It's all about working together," he said.